TheMetalBikini.com- X-Wing Miniatures and more: This Week: Imperial Aces Extravaganza! 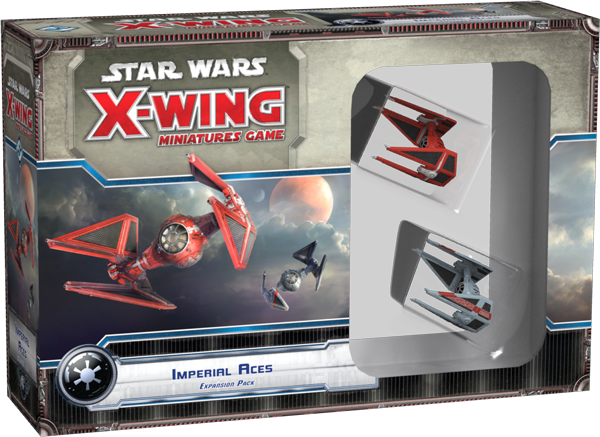 As I'm sure y'all recall, back in September, it was announced that FFG was going to release a special, two-ship expansion for the Empire called Imperial Aces. Speculation rode rampant on the internets and in FLGS all over the place as we all hoped against hope that FFG would release the set for Christmas as many of us are "those guys" who are into all kinds of odd stuff and are "hard to buy for." Those of us who have bought FFG product (including this one) for awhile, look at release dates with kind of a tired skepticism- a bit like that friend of yours who always has some can't miss cockamamie get rich quick scheme idea. 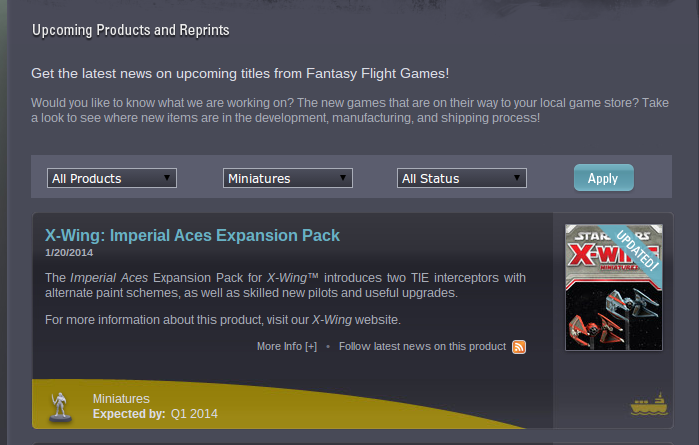 Anyway, almost as if in the form of a non-verbal apology, FFG released some more info on Imperial Aces back on 2 January. And the email came flooding in. What did I think about this pilot? Had I heard about this Modification? But of course, the most important question- when will it be released? Well, I still don't know. Unfortunately, even though I do all this writing and you guys come by here all the time, I still don't get any inside info from FFG or anything. More or less, I usually know what you know- with the slight exception of having dozens of you guys emailing me when some kind of X-Wing news does break (which is awesome, by the way- it's much appreciated and keep it up, please!). What I can tell you is that the expansion is "On the Boat." What exactly does that mean? Well, they're on the boat from the factory, I guess. FFG says they could be coming from China, Germany, or here in the States, depending and that this step can take 4 to 6 weeks. I have no idea when the status of Imperial Aces went to On the Boat, so I can't say when that 4 to 6 weeks might expire, but they're supposed to be released Q1, so that could be anywhere from tomorrow to what, March? For what it's worth, Wave 2 had a Q1 release after it was all said and done, and those came out right around my birthday which is 3 March. I was talking about it on here if you're really curious as to the exact date. So after On the Boat, there are two more steps- Shipping Now, which as you'd expect is the distribution after the miniatures arrive at FFG in Minnesota and In Stores Now which should be self-explanatory. I figure though since I've finally wrapped up the Wave 3 stuff, now would be a fun time to kill a week talking about Imperial Aces, so the next four days I'll be talking about each of the named pilots in my usual TMB style. I don't know if all of the upgrade cards have been fully revealed, and I'm very curious about the scenario that's included as it seems to point towards a newer TIE model, so I'm sure we'll still have stuff to talk about once the ball really drops and we all get these fighters in our hands, but we can at least run through the spoiled named pilots and talk about fun ways we can roll them in our own Imperial Squadrons.